Scientific misconduct should be a crime: It’s like fraud or theft, only more dangerous. It’s as bad as fraud or theft, only potentially more dangerous. 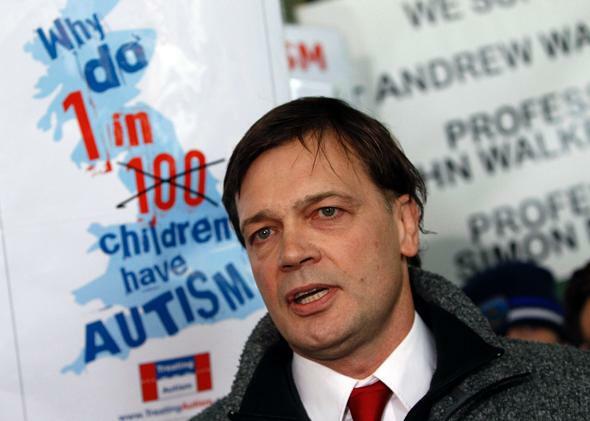 A clear example of the harm of scientific misconduct is the infamous MMR-vaccine paper by Andrew Wakefield (above) that was published in The Lancet. Richard Smith edited the BMJ from 1991 to 2004. He is a founding member of the Committee on Publication Ethics, a former trustee of the U.K. Research Integrity Office and author of The Trouble with Medical Journals. Research misconduct degrades trust in science and causes real-world harm. As such, Smith says, it should be a crime akin to fraud. Why should research misconduct be illegal? After 30 years of observing how science deals with the problem, I have sadly come to the conclusion that it should be a crime, for three main reasons. First, in a lot of cases, people have been given substantial grants to do honest research, so it really is no different from financial fraud or theft. Second, we have a whole criminal justice system that is in the business of gathering and weighing evidence—which universities and other employers of researchers are not very good at. And finally, science itself has failed to deal adequately with research misconduct. How can we recognize honest mistakes? It’s quite difficult. Clearly not every minor misconduct should be regarded as a crime. And, as with all laws, it will take time to establish what merits prosecution and what can be dealt with by a reprimand. But we know peer review doesn’t detect all misconduct. If research seems wrong or impossible, we start with the assumption that it’s just an honest mistake and then look into it. You can sometimes detect fraud statistically, because if you invent data you tend to come up with a recurrent pattern. But in most cases, it is detected because somebody blows a whistle. Are there cases in which you think researchers should have been prosecuted? There are cases where someone demonstrated intent, not simply made a horrible mistake. For example, I was involved in the case of a researcher named Malcolm Pearce, who published two papers in the British Journal of Obstetrics and Gynaecology. One was a case report of successfully re-implanting an ectopic pregnancy into a patient’s womb and another was a randomized trial about treating recurrent miscarriage. It turned out the case study patient did not exist, and there was also no record that he had actually conducted this randomized trial. Those aren’t honest errors. The facts speak for themselves. Does scientific misconduct often cause real social harm? To begin with, there is the loss of confidence in science. But another example of clear, obvious harm is the infamous MMR-vaccine paper by Andrew Wakefield that was published in The Lancet. It suggested that the vaccine was a cause of autism, and that idea absolutely took off, causing dramatic drops in childhood vaccinations. This in turn caused outbreaks of diseases such as measles. Eventually, when claims in the paper were proven to be false, The Lancet retracted it. These types of things often ruin researchers’ careers. Is that punishment enough? There are many examples in which researchers have simply carried on with their careers. I believe scientists should be held to a higher standard. Those who commit research misconduct cannot be trusted. It’s too easy to be tempted into ignoring or destroying data that undermines your work. It may seem an inhuman way to be, but a true scientist is delighted when his or her favorite hypothesis is destroyed by good data.